Texas Woman’s University is a public university in Texas that, despite its name, also accepts male students. 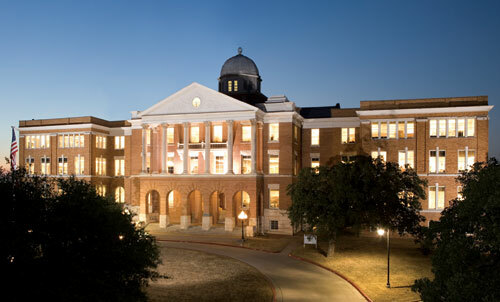 Founded as the Texas Industrial Institute and College for the Education of White Girls of the State of Texas in the Arts and Sciences in 1901, it then became the Girls Industrial College and the Texas State College for Women. Established as a college of higher learning designed just for female students, it admitted its first male students in the 1960s but only allowed those students to enroll in some of its graduate classes. It became TWU in 1957 and admitted men into all of its programs starting in the 1990s. Though males can now apply to all its programs, more than 90% of its students are still female. TWU created one of the first accredited nursing programs in the state, and that program is still popular today. It also offers programs in education, business, computer science and other fields. The five colleges that operate on its campus have dozens of majors available for both undergrad and graduate students. Both Forbes and Washington Monthly consider Texas Woman’s University as one of the best colleges in America. The Commission on Collegiate Nursing Education, which accredited its nursing program since the 1950s, is just one of the organizations that granted TWU program accreditation. It has accreditation for its dietetics internships from the Academy of Nutrition and Dietetics, for its dental hygiene program from the American Dental Association and for its physical therapy program from the American Physical Therapy Association. Some of its other degree programs have accreditation from the American Occupational Therapy Association, Council on Social Work Education Office of Social Work Accreditation and American Speech Language Hearing Association. Another thing to keep in mind is that TWU has regional accreditation. Regional accreditation is especially important for students who need financial aid. The Department of Education only allows students to seek financial aid and use the FAFSA is they attend an accredited college or university. This type of accreditation comes from the Southern Association of Colleges and Schools (SACS). Like other accrediting agencies, the SACS requires that the university renew its accreditation and apply for a renewal at least once every 10 years. Though TWU has an online graduate school application that is open to all students, each graduate program has different requirements. Those applying to one of its graduate programs in education must have a cumulative grade point average of 2.75 in all undergrad courses. They’ll also need to take EDUC or an equivalent course and score at least a C in that class. Students must also maintain a GPA of 3.0 or higher in the last 60 credits of work they did at the bachelor’s level. A faculty adviser will meet with prospective students to talk about the program as well. Students must successfully pass this interview to enroll in the program. In addition to the main application, the Teacher Education program has a separate application that students must complete. This application includes a professional ethics documents that students must sign. This document states that students understand the policies put in place by the university. Those policies essentially state that students caught violating professional ethics or standards can lose their spots in the program. The TWU main application goes over areas such as a student’s current address, colleges attended, professional experiences and whether the student has a current and valid teaching license in Texas or another state. With fees included, TWU charges just over $250 per credit hour for Texas students enrolled in a graduate program. The cost for nonresidents is closer to $660 per credit hour. TWU offers a lower tuition rate for Oklahoma residents that helps students save a little on tuition. Those living in Texas must submit proof of residency to the bursar’s office and sign a residency document. Graduate students will pay extra for any of the supplies that they need in their classes as well as any required textbooks. TWU recommends that education graduate students consider applying for a TEACH grant from the federal government. This grant provides students with up to $4,000 a year while enrolled in graduate school, but students agree to spend at least four years teaching in a public school later. The federal government also offers unsubsidized and subsidized loans for students in graduate school. Parents of enrolled or accepted students can apply for PLUS loans too. Another option is a private or alternative student loan. Lenders base interest rates and borrowing limits on the student’s credit history. Students have the option of applying for one of these loans with a co-signer who has better credit. The Master of Education in Special Education available from Texas Woman’s University actually refers to two different programs. Students have the option of selecting a concentration in intervention specialist work or educational diagnostician work. The intervention specialist concentration teaches students how to examine evidence and how to use that evidence to stage interventions in the classroom. Students must have a bachelor’s degree and take at least one special education class at the bachelor’s level before enrolling. They take nine credits of courses on working with exceptional students like students with emotional and behavioral disorders and individuals with learning disabilities. The program requires that they take 12 credits of classes on interventions, nine credits of support courses and six credits of research classes. These research classes culminate in a a professional paper on an educational topic that the student writes. Its educational diagnostician concentration can help students gain the certification necessary to work as an educational diagnostician. This program better prepares students for working as leaders and training special education teachers. Those applying to the program must have a bachelor’s degree and a valid Texas teaching license or certification. Students must complete 39 credits of work in fields like research, assessment, support and interventions. Courses in this program include legal and administrative issues in special education, instructional interventions, clinical instruction in intellectual assessment, developmental disabilities and using assessment for effective interventions. Texas Woman’s University also requires that educational diagnostician majors take a course on educational research and spend a semester writing a final paper.